Henry "Hank" Paulson, Jr. has a unique and intimate perspective on China's economic rise. As chief executive of Goldman Sachs, Paulson played a key role in introducing private capital to China's state-owned enterprises. As treasury secretary, Paulson created the highly successful Strategic and Economic Dialogue (S&ED) series and guided bilateral talks during global financial upheaval. 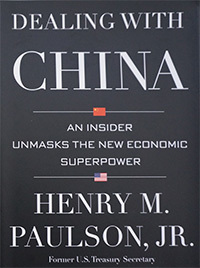 In his new book Dealing With China , Paulson draws on his uncommon level of access to modern China's political and business elite, including its three most recent heads of state, to answer several key questions: How did China become an economic superpower so quickly? What are the best ways for Western business and political leaders to work with, compete with, and benefit from China? How can the United States negotiate with and influence China given its "authoritarian rule," its massive environmental concerns, and its huge population's unrelenting demands for economic growth and security? Paulson divides his 403-page book into three sections: Banking on Reform focusing on his work with Goldman Sachs; Breaking New Ground as head of the U.S. Treasury; and Building New Ground on his new think tank the Paulson Institute. The strength of his work is his caution against expecting China to fit into a Western mold. It would be "naive" to expect China to become exactly like the United States as it develops. While Paulson draws parallels between China and America's own rise as a world-leading economy, he also makes distinctions on China's unique heritage in Confucian values and the large role that state-owned enterprises play in development. Sprinkled within the analysis and commentary is a wealth of private anecdotes that fascinate and illuminate the nature of high-level relations between the world's two largest economies. In one, Paulson writes of meeting with Gao Yan, former head of China's State Power Corp., the day of the 9/11 terrorist attacks in New York. The Chinese executive (who as it happened later fled China in the wake of a $1 billion corruption scandal) came off as unsympathetic, preoccupied with making sure the restaurant played his favorite song and without a word of condolence on one of America's darkest days. Paulson also includes selections of personal pictures: practicing tai chi in a Beijing park, climbing the Great Wall with his family; checking out a smartphone app with Zhou Qiang, President of the Supreme People's Court, and hugging a giant panda cub in Sichuan. Paulson also spends much time writing on environmental protection issues that he and his wife Wendy have taken up as a personal cause. Paulson calls climate change the "biggest economic risk we face." And, unlike the 2008 financial crisis, the government will not be able to pull off a bailout at the last minute. How can China balance economic growth with environmental responsibility? The answer, Paulson says, is to view the environment and the economy as two sides of the same coin, and that no prosperity without sustainability is true growth. The Financial Times calls Dealing With China a "must-read for anyone who deals with China and possesses an aircraft carrier or two" and acknowledges that Paulson is rivaled only by Henry Kissinger in his level of meaningful access to the Chinese elite--but anyone looking for a juicy tell-all of what happens behind closed doors would be disappointed. Paulson, if anything, is discreet and diplomatic. "There are some who believe that an immutable law of history holds that conflict is inevitable when a rising power begins to bump up against an established one. But no law is immutable," Paulson writes. "Choices matter. Lessons can be learned. And statesmen and stateswomen can, and do, make a difference." Almost all of modern challenges facing our increasingly complex and interconnected world--from cybersecurity to opening up big markets for American exports--will be easier if China and the United States work together, he adds. Paulson makes several recommendations for how the United States can adjust to the rising economic and political might of China. First and foremost among them, he writes, is to "help those who help ourselves" by supporting reformers like President Xi Jinping achieve their economic goals. Much like charity, however, Paulson advises that with respect to the U.S. dealing with its giant neighbor, efforts should begin in the home. "In the final analysis, our self-induced weakness is more of a problem for us than is China's rise. At the risk of sounding utterly simplistic, once we have dealt with our own problems, we will find it far easier to deal with China," Paulson concludes.